This was my first trip to Venice and frankly I had low expectations after I told many I was going in June. I got the “Oh it’s going to be so crowded and hot” comment over and over. Not fond of crowds, I was apprehensive. I spent 2.5 days in Venice with my friend Page, and I found myself pleasantly surprised by its rundown charm. I’m glad I visited the city before it sinks! We ended our ten-day tour of Croatia, Slovenia, and Italy with Mountain Travel Sobek in Vicenza. Our guides drove us to Venice and then helped us board a water taxi to get to our final destination. I was very thankful for this help as it gave me a chance to observe and learn the lay of the land. We were even more fortunate to find our hotel, NH Collection Venezia Palazzo Barocci, located right next to the San Angelo water taxi platform which ended up being a godsend! No dragging bags through the alleyways of Venice required! unique lamp in our room! Our hotel was fantastic in multiple ways. 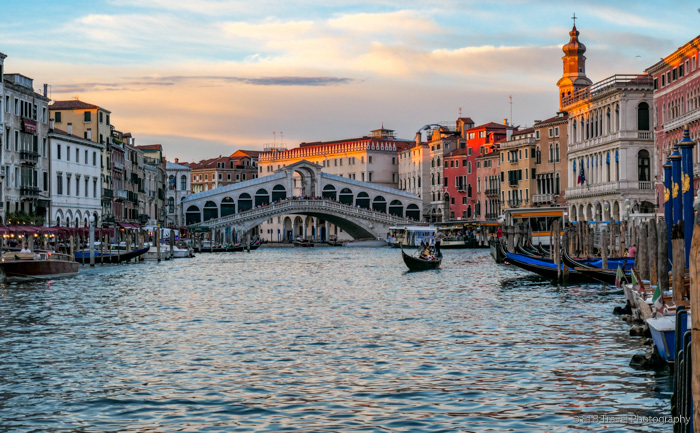 It is centrally located between the Rialto Bridge and St. Mark’s Square. As I mentioned earlier, it is next to the San Angelo vaporetto stop. In addition, it is a straight shot on the airport Alilaguna shuttle…no transferring required. To top it off, this area on the Grand Canal was less crowded. The staff was friendly and knowledgeable. Pitchers of water and bowls of candy were available to hotel guests in the lobby. The room was a decent size for European standards, nicely decorated, comfortable with good A/C, and came with a welcome bottle of sparkling wine. I found the recommendation for the hotel on the Facebook site Girls Love Travel, and I couldn’t have been more pleased with the selection. We completely lucked out! Of the 2.5 days in Venice, we spent an evening in search of dinner, a day in the islands and a day in Venice. Our first night, we took the advice of Rick Steve’s and tried visiting the Cicchetti Strip: Four Venetian Tapas Bars in a 100-yard strip not far from the Rialto Bridge. In his defense, he said these places were best for lunch, but he also said they were open for dinner. The four places to visit are Bar all’Arco, Cantina DoMori, Osteria ai Storti, and Cantina Do Spade. The first two were either closed on dead on Friday night, so we ventured to the final two and Cantina Do Spade seemed the most lively with locals. We were lucky to get the last table for two. Having said that, we (with the help of the waitress messed everything up)! First, we failed to order in cicchetti (essentially small plates of counter food). Instead we ordered dinner. The waitress listed a shrimp pasta with artichoke as a special and we both ordered this. Page asked for the “shrimp pasta” and I added on that I’d like that too, “the special”. Well, we got shrimp pasta, but not the special and it wasn’t good. In addition, we ordered sparkling water, but got still. Finally the half carafe of white wine came as a full one and we were charged accordingly. I’ll chock is up to a language barrier I guess. At least it was a nice atmosphere. With only one day in Venice, we packed in the sight-seeing. While we walked most of the time, it paid to buy a two-day vaporetto pass which saved our tired feet at the end of the day after we packed in countless tourist attractions. Of course, we saw the Rialto Bridge on our first evening out as we went in search of the “cicchetti strip”. It is now one of four bridges that cross the Grand Canal. It was the only bridge crossing from 1180 until 1854. The original crossing was a platform supported by boats. In the 13th century it was replaced with a wooden draw bridge. The current structure was constructed in 1588. Marking the midway point of the Grand Canal, this central location attracted merchants and retail shops both on and around the bridge like that of Ponte Vecchio in Florence. It offers tremendous views of the canal though it takes a while to wedge into a place between tourists near the railing to snap a good photo. Next to the Rialto Bridge is Campo San Giocomo named for the church it faces. The church’s facade is one of the oldest in the city. The clock without hour and minute hands displays roman numerals. Roman numeral I is located in the direction of east as that is when the sun rises and the day starts! This square and neighborhood was the economical capital of Medieval Europe before the 1550’s when it suffered an economic downturn. The streets now lined with shops, used to be lined with banks before a destructive fire in 1514. The church is the only building left that predates the fire. We arose early to beat the crowd at St. Mark’s Square. Along our 15-minute walk to the square, we stopped for a coffee and pastry at Caffe Brasilia which was highly recommended (#14) on Trip Advisor. The staff was friendly and the coffee was good, but the pastries tasted at least a day old, thus I was disappointed after reading such rave reviews. Anyway, we carried on to the enormous square which much to my relief was virtually empty at 8:15am. We strolled through the square and along the waterfront before visiting the Doge Palace at its opening, 8:30am. This may be the only tourist attraction that opens prior to 9 or 10 am, so we started here with a “skip the line” online ticket from Tiqets. Tiqets was one of the few sites that offered a digital ticket that didn’t require a paper print out or a voucher which had to be redeemed for a ticket at the attraction. As such, this was the best option, though we went so early that there wasn’t much of a line to skip. In fact, we were the first to enter the palace! Visiting the Doge Palace at 8:30am also avoids many of the tour groups and cruise ship passengers. After entering the palace, we rented the audio tour which was VERY detailed. Toward the end, we began fast-forwarding through some of the descriptions. Overall, however, some sort of tour is worth a purchase. We considered the Secret Itineraries Tour which is supposed to be excellent and includes rooms that are off limits to the public, but it was in the middle of the day and it sold out a few days in advance. Listening to the audio guide takes about 1.5 hours. It led us through the courtyard to the Stairway of Giants; up the Golden Staircase; through a variety of rooms adorned with paintings by Titian, Veronese, and Tintoretto; across the famous Bridge of Sighs; and down into the prisons. I particularly liked the Golden Staircase and the enormous Hall of Grand Council that can accommodate 2,600 people at one time! While it would seem logical to visit the Basilica after visiting the Doge since they stand next to one another, a few things encouraged us to visit later in the day. First, no large bags are allowed. Donned with a water bottle, some snacks, a raincoat and camera, I figured it was best to drop these things off at the hotel before stopping at the church late in the day and then enjoying an evening out in the area. Additionally, the “skip the line” website suggested a later time to avoid the crowds. As such, we selected a time around 3pm and followed the Rick Steve’s tour. Without a “skip the line” ticket, the basilica is free to enter, but plan on waiting a while! The 3 euros is highly worth its investment if time is an issue. What I found to be slightly annoying is many of the attractions inside the church including the Golden Altarpiece, the Treasury, and the Museum all required a fee. I’d prefer just paying one fee at the beginning rather than to wait in three different lines to be nickeled and dimed. As such, we skipped the “pay for” attractions and followed the Rick Steve’s audio guide which was also quite detailed like that of the Doge. With the steady stream of visitors being guided like cattle through cordoned aisles, I think this is one of the few times it would be nice just to stand there and take in the surroundings without knowing one thing about the church. Regardless, we enjoyed the short visit. From St. Mark’s Square we walked by a variety of smaller attractions as we headed west past Harry’s American Bar, to Calle Larga XXII Marzo lined with designer shops, past San Moisè Church and La Fernice Opera House to Accademia Bridge. Along the way we took a small detour to visit Page’s aunt’s art show that coincidently was on display while we were in Venice. Unfortunately, the gallery, Palazzo Ferro Fini is closed on the weekends, so we didn’t get to see Nancy Genn’s works. Page trying to see her aunt’s art show. Upon reaching Accademia Bridge, we didn’t find the surrounding area (mostly filled with museums) terribly interesting, so we hopped on the vaporetto and headed to the San Toma stop to explore the San Polo District. The vaporettos get busier as the day goes on. All I could think about is what would happen if the boat sank. There is no limit to the amount of people that are allowed on the vessel. There are no safety instructions. Who knows where to find life vests! I always stood in the open area for the breeze and next to the exit! Here we disembarked, visited the Church of San Polo and finally found a place that opened for lunch prior to noon. Located on the Campo San Polo, Pizzeria Bar Cico served one of our better meals in Venice. Perhaps we were just hungry as I later looked up mostly lackluster reviews. Our experience was pleasant with nice wait staff and tasty food. We followed the crowds along the Ruga toward the produce and fish market. The main street was lined with mask stores, candy shops, bakeries, jewelry stores, art shops, clothing shops and everything in between. With many practical stores, it had more of a local feel despite the mobs of tourists. We reached the market as it was closing down. While I would have liked to see it bustling in the early morning, it was still fun to see. I love to experience how the locals live. The hot afternoon encouraged us to take a vaporetto ride back to our hotel for a short rest and cooling off period before we ventured to the Basilica for our afternoon tour already described above. Thereafter, we created our own bar and restaurant tour beginning at Harry’s American Bar just west of St. Mark’s Square. Its sign hidden in the window and its non-descript exterior makes it easy to miss. Hemingway put the bar on the map and it was a favorite haunt of Brad and Angelina. We didn’t try their famous, over-priced Bellini which was created here, but we did order a beverage and the greasiest, yet tasty and most expensive ham and cheese sandwich I’ve ever had. From Harry’s we carried on to the Gritti Palace, where the only famous people we spotted were pictures on the hotel wall. Regardless, we felt the need to sit on the bar patio overlooking the Grand Canal and buy outrageously priced Aperol Spritz. At least hazelnuts, olives and potato chips came with the $50+ bill! As we sipped our cocktails, we watched a wedding party cruise down the canal in water taxis…FUN! Our final stop of the night was at a restaurant called Ristorante da Raffaele whose menu we spied earlier in the day. Located on a side canal, we figured it would have a nice evening atmosphere. We were right. We got the last table outside! While the staff was friendly and service quick, my meal wasn’t much to write home about. Of all the places we visited in Venice (both recommended and random places), we found most of the cuisine to be fair. Given how romantic Venice is considered to be, I was surprised by this finding. Perhaps the quality just seemed mediocre since we just finished a week long culinary tour through Croatia and Slovenia. But to say the best meal we had was a ham and cheese sandwich (and I don’t usually like ham), is sort of sad. I felt like I was in Venice again!